Gale Mejia-Abregana, left, Daphne Tong and Tasha Valenzuela waved "HIRED" applications yesterday. They were actually filming a public service announcement at the University of Hawaii at Manoa, to start airing Jan. 11 on KITV-4, encouraging Hawaii students to get a higher education to broaden their job opportunities and better prepare them to be hired. 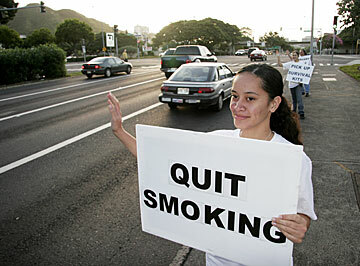 Students from Kaimuki High held anti-smoking signs yesterday on Vineyard Boulevard near Pali Highway. Sign wavers had different sequential signs on quitting smoking, reminiscent of the old Burma-Shave highway signs. One such sign was displayed by Faaumu Anitoni.